It has left Virginia Tech fans in a state of bewilderment. Like most college fans, Hokie Nation always acts one step away from needing lithium to control its emotional state. The positive ones this morning are shouting from the rooftop it’s nobody’s fault, the team has no talent, they lost too many defensive players in the offseason, etc. There is truth in some of that. The negative ones are off the rails. This team won’t win another game this season, they say. The bowl streak will end. Justin Fuente, Bud Foster, Whit Babcock….they all need to go according to Twitter. One fan wants Virginia Tech to go steal Old Dominion’s coaching staff because they at least know how to coach an upset win. Calm down, I say to those folks. Walk away from the keyboard. But the loss was troubling no matter which side of the manic depressive fan curve you’re on. Foster isn’t perfect, but he’s put together a defense consistently year in and year out that more times than not has made the big stop in key games and kept that bowl streak alive. That he could put a group of 11 out on a field that offered such little resistance is something that has given a lot of long-time fans pause. It’s like being told there is no Santa Claus, as stuff like that is not suppose to happen no matter how many people are injured. Making it worse is that those that watched practice during the week knew it was going to happen. The Virginia Tech scout team – running Georgia Tech’s offense – had a lot of success against the No. 1 Hokie defense during the week. The real Georgia Tech offense just turned it up a notch Thursday night. Keep in mind Virginia Tech had a bye week last Saturday so they had an extra week to prepare. Imagine how bad it would have been if they only had one week to get ready. Then there’s the opinion of Fuente these days. I like him. He says the right things. He carries himself well. He’s a great reflection on the University. But the third year is always considered a watershed year for any coach new to a program. The first two years you win with your predecessor’s talent while you go recruit your own. By year 3, you’re coaching the ones you picked, and it gives you a better idea of what’s coming in years 4, 5 and 6. In year 3, Fuente has now gone 0-3 against Georgia Tech. They’ve been upset by a winless Old Dominion team. They’ve given up 45 points in one game and 49 in two others. 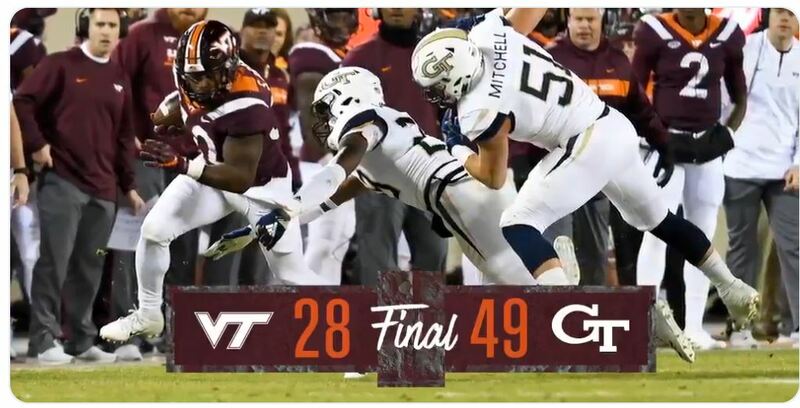 The last time a Virginia Tech team gave up over 45 points 3 times in a season? You have to go back to 1950: That team was 0-10, and gave up 45 to UVA, 54 to William and Mary, 47 to Duke, 63 to Maryland and 61 to the Quantico Marines. I wasn’t born then, but I hear the Marines in 1950 could really get after you. Fuente isn’t the defensive coordinator, for those who would say all the blame for this needs to go on Foster. My counter would be while true, some of the problem has been defensive schemes and technique, while some is just discipline. In that regard, Fuente as the head coach shares some of that responsibility. He’s also responsible for setting the tone, being a master salesman to make his team believe they can do improbable things, and simplifying things to make sure certain aspects of the game plan become a priority and are accomplished. You saw some of that on offense, as the team came down the field and scored on its first three possessions. You didn’t see that on defense. That unit looked defeated from the first drive. Knowing Fuente, he’ll get all of that done this week. He historically has followed upset losses with strong performances and wins. I still like him and believe he will figure it out. But the loss last night has created a cloud of doubt, no matter how big a fan you are. Was last night’s defense an anomaly, or is this how it’s going to be the rest of the season? We loved Fuente when he won 10 games the first season and 9 games the second. But will we love him if he only wins 6 this year? And of course, the biggest doubt of all, will this be the year Virginia comes to our house, stomps us and ends the 14-year streak? It’s not a good place to be. For a fan. For a coach trying to recruit an athlete to come here. For an athletic department trying to sell out its stadium. Yes, Virginia Tech puts on the best pregame show of any school in the country with it’s Enter Sandman tradition. ESPN loves it, and we all replay it on Youtube repeatedly in the offseason. But this is twice in three weeks the nation has seen an incredible appetizer, then was served a meal that was neither properly prepared nor appetizing. Will they turn it around and finish the season on a stronger note? I think so. I’ve seen it happen many times before. Good teams respond when their back is to the wall, and I still think this is a good team. But after last night, I won’t argue the point if you believe differently. Georgia Tech showed me 49 reasons not to.